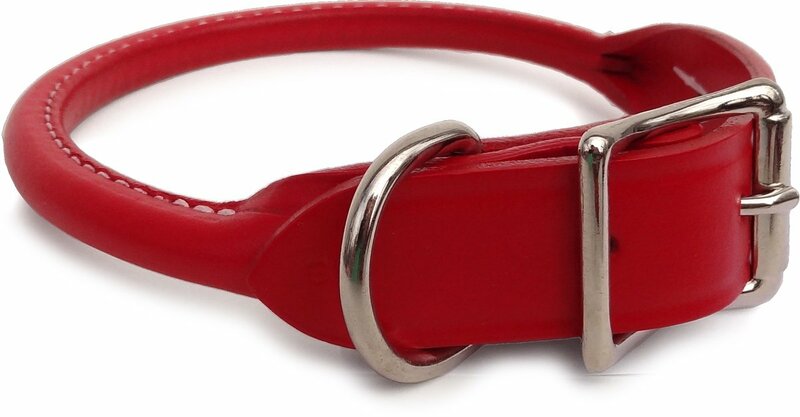 [is_logged_in]A rolled leather dog collar (a.k.a. a rolled collar) is well suited for dogs that have long, thick fur.Their round shape keeps your dog’s hair from becoming tangled and matted while wearing this collar. Of course, they look great on short-haired dogs as well. At the same time, they tend not to irritate the dogs’ fur or their sensitive skin. It’s important to make sure that you choose a high-quality collar. There are plenty of aspects to evaluate and I will cover these in the article later. But, first, I would like to go through my favourites. When selecting a rolled collar for you buddy, you want to make sure you use a quality leather material. There are plenty of cheap collars in the market for $10 a pop. These are made of poor material and you are better off not buying these since they do not size properly, they are uncomfortable for the dog and get worn and wrecked easily. This is my favourite brand of leather collar after going through rolled collars from atleast a dozen companies over the years. You need to look no further than a couple of reviews on Amazon on what other pet owners think about this collar. And then the most popular of them all. 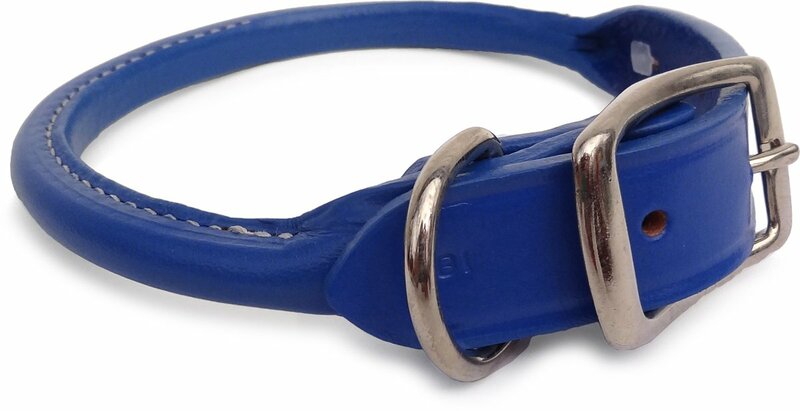 The tan rolled leather dog collar is desired by many dog owners. It has a certain appeal to it and looks very elegant. If you want a Martingale rolled leather collar, you are in luck, Auburn leathercrafters also make good leather Martingale collars. A dog collar and leash look great when they are matched. So, if you are looking to buy a leather rolled collar, you should really consider getting a rolled leather dog leash too. Not only, does it look great, it gives a sense of uniformity and gives a better control. Another one of my favourites is the rolled dog leash by Barbohas Dog Supplies.It is another rolled dog leash which is of good quality and durable at a lower price range. It measures 24″ long, 3/8″ wide – designed for medium dogs, perfect leash for daily walks. I have recommended this to a lot of people and most of them have loved it. Click here to buy this on Amazon. So, we have made it pretty simple to select a rolled collar for your best friend. But, for the sake of this guide, I want to cover the factors you need to consider when opting for a rolled leather collar for your dog. These collars are thicker than flat collars. This keeps them from becoming frayed on the outside. Nonetheless, it’s just as important to make sure you get the right size. So, how do you measure your pet to know what size you’ll need? To begin with, it’s important to understand that the correct fit for your dog is the one that will keep him safe. If the collar isn’t tight enough, he’ll be able to slip his head out of it easily. Loose collars also pose the risk for your dog to get caught up on something and choke. On the other hand, if it’s too tight, it may be uncomfortable, cause him difficulty with breathing, or even incur an injury. Now that you understand the importance of choosing the right size, here’s how to measure to find that size. Use a flexible tape measure that you can place around your dog’s neck or if one is not available, wrap a piece of string loosely around your dog’s neck so that you can measure it. If your dog’s neck measures between two different sizes, always opt for the larger size. This is especially true when measuring a puppy because he’ll grow fast. Keep in mind that a collar provides two inches for adjustments. This means it’s actually two inches longer than what is stated on the packaging. For instance, a 14-inch collar will fit a dog anywhere from 14 – 16 inches. Additionally, keep in mind that veterinarians recommend that you be able to slip two fingers between the collar and your dog’s neck easily. Once you find the right size of collar at the pet store, you’ll want to look at the stitching. There should be another piece of leather that’s either glued or stitched in between the two edges. This reinforces the edges and ensures that they are indeed round. It also provides a smooth surface for around your dog’s neck. Make sure that it’s evenly stitched without any tearing or fraying. You’ll know it’s a good collar because it won’t have a middle piece of leather. In other words, there won’t be two sides rolled together in what might form a sharp edge, increasing the possibility of injury. You’ll want a strong buckle that’s not stamped (e.g. a flat metal piece whose edges are bent under). This is because these types of buckles are thin, making them easier to break and scratch your dog. They also tend to rust faster in the wrong conditions, which is problematic for outdoor dogs. On the other hand, when you buy a cast buckle, it is thicker and solid the whole way through. Its edges are round, and a better metal is used. For instance, there are some brands that make their buckles out of nickel, which won’t rust or corrode. Make sure that every piece of hardware on the collar has been riveted in. In this respect, you’ll want to inspect the main stress points on the collar, which include both the buckle and the D-ring. These things are important because your collar is only as good as the hardware that’s holding it together and securing your dog. These need to be smooth and evenly punched. This shows how much care was actually put into constructing the collar. This is another important area, whereby you’ll see how much care has gone into the workmanship is whether or not the leather was treated. If you have an outdoor dog, this is particularly significant because treated leather is impenetrable by the elements, and thus it’s able to last a lot longer. Although it’s really important to make sure that your dog’s collar is of the highest quality, you’ll also want to make sure that it’s fashionable. After all, this is why so many different collars are available, including black, brown, pink, red and yellow. These are also available in combinations as well. This is different from other collars because with leather collars, any and all colors are available whereas you may be limited by the colors that non-leather collars have available. Of course, leather in and of itself, is also fashionable. Since your dog’s collar is meant to give you with a sense of security, you’ll want to take a few minutes to think about them. Don’t simply choose any old collar just so your dog has an ID on him. While this is important if your dog ever gets lost, your collar is also a great way to dress him up while also showing off your own personality at the same time. After all, this is why there are so many different materials that dog collars are made of today. One of the most popular types of collars is the rolled leather collar. These are classic and will look good on any dog. Furthermore, there’s a variety of leather available, so that you get what you like. At the same time, they’re also very durable without requiring much care. When you head out to buy your new dog collar, make sure to keep the aforementioned points in mind. With a properly fitted leather dog collar, your dog will be safe and secure, which will give you great peace of mind too. In all reality, what more can you ask for from a dog collar? So, what brand rolled leather collar do you recommend?